I’m currently helping a lovely couple with the interior design of their new home. They moved from the North East and were able to buy a house that has a lot of potential. It is their first home and they are ready to be more intentional about design. The process is going to take a while, but as we tackle all the rooms in their home, they’ll start seeing a real change into a space that meets their needs and reflects their lifestyle, yet looks and feels intentional. They are a young Torah observant couple with two kids. Most of the furniture we’re currently working with is stuff that they’ve been accumulating as hand me downs, or things bought for practical reasons, but that don’t necessarily work in the new home. At our initial meeting, my friend shared with me all the things she wanted to change and improve in her home. I suggested we start with the Master Bedroom. I could sense that she was feeling somewhat overwhelmed about all the things she wanted to achieve in her new house. The Master Bedroom is one of the rooms that will be easier to tackle. It mostly involves a re-paint and re-decorating job, where as the rest of the house involves more complex design and construction decisions. I want her to have the satisfaction of a finished room that she can enjoy pretty quickly before we move on to other spaces in the house. They like comfortable spaces, that have a casual feel. At the same time they are pretty traditional and so is the structure of their home. 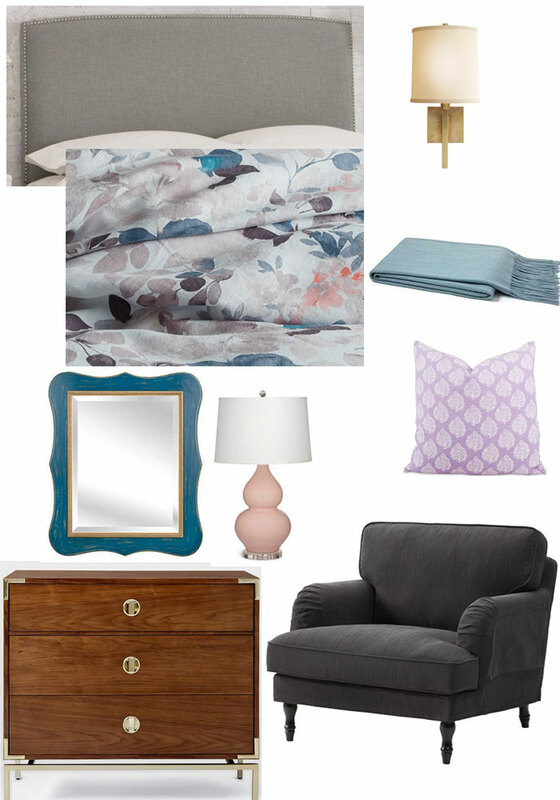 So here’s the inspiration board I created for their Master Bedroom. I suggested Benjamin Moore’s Classic Gray for the walls. It’s definitely one of my favorite grays, and I think it works especially well in bedrooms. This room feels so fresh to me for a young couple with little kids. Bear in mind that because this couple observes the Laws of Family Purity, there will be two beds in this room, both with headboards. I chose something simple, that could stay with them many years. Because of the Laws of Family Purity, I chose bedding with color. A flower print duvet will give us different options for colored sheets, as white bedding is not an option in this case. The dresser is somewhat of an investment, but I absolutely love how it grounds the room and adds a masculine element. It’s such a classic piece that it will be able to stay with them for many years and could eventually be used elsewhere in the house if needed. So what do you think? Doesn’t it feel fresh, young, yet relaxing at the same time? I cannot share sources at this time, but I’ll come back with a Get the Look post once we have the room finished and I show you the final reveal.